Well, we barely scratched the surface here, but I guess that this should be enough to get you started, so that you can begin exploring Pure on your own. You can find more examples on the Examples page. Please also have a look at the Rewriting page which explains in more detail how function definitions work in Pure, and at the Addons page which lists the addon libraries available for doing practical programming with GUIs, graphics, databases, etc. To exit the interpreter, just type the quit command at the beginning of a line (on Unix systems, typing the end-of-file character Ctrl-D will do the same). Lines beginning with ** indicate that the evaluation was interrupted to show the rule which is currently being considered, along with the current depth of the call stack, the invoked function and the values of parameters and other local variables in the current lexical environment. 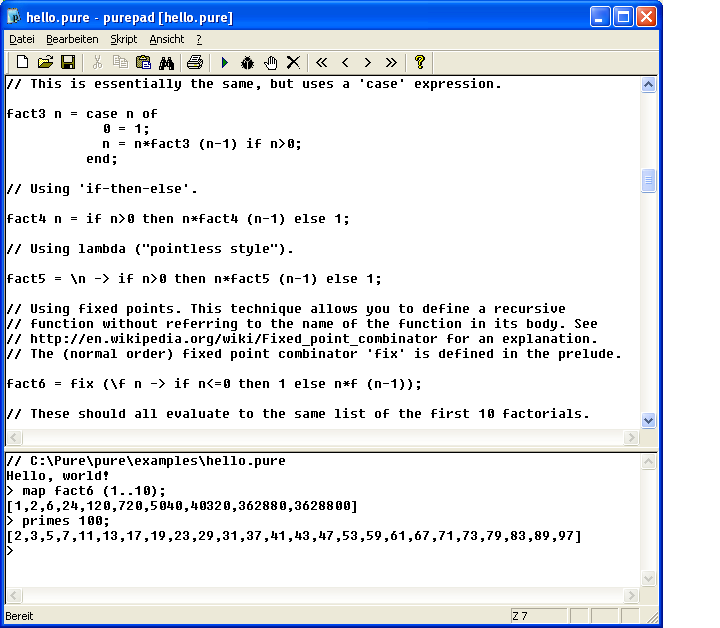 The prefix ++ denotes reductions which were actually performed during the evaluation and the results that were returned by the function call (printed as --> return value). In the above example we just kept hitting the carriage return key to walk through the evaluation step by step. But at the debugger prompt : you can also enter various special debugger commands, e.g., to print and navigate the call stack, step over the current call, or continue the evaluation unattended until you hit another breakpoint. If you know other source level debuggers like gdb then you should feel right at home. More information about the debugger can be found in the Pure Manual. This considerably reduces startup times and lets you deploy Pure programs on systems without an installation of the Pure interpreter (the runtime library is still needed, though). Please refer to the Pure Manual for details. A number of other command line options are available; try pure -h for a list of those. When running interactively, the Pure interpreter usually employs the GNU readline library to provide some useful command line editing facilities. The cursor up and down keys can then be used to walk through the command history, existing commands can be edited and resubmitted with the Return key, etc. The command history is saved in the .pure_history file in your home directory between different invocations of the interpreter. Moreover, Pure's pure-readline module provides an interface to the readline library so that you can use it in your Pure programs, too. To run the script now just type Ctrl-C Ctrl-K. This will open a **pure-eval** window in Emacs in which you can execute Pure interpreter commands as usual. This has the added benefit that you can get a transcript of your interpreter session simply by saving the contents of the **pure-eval** buffer in a file. 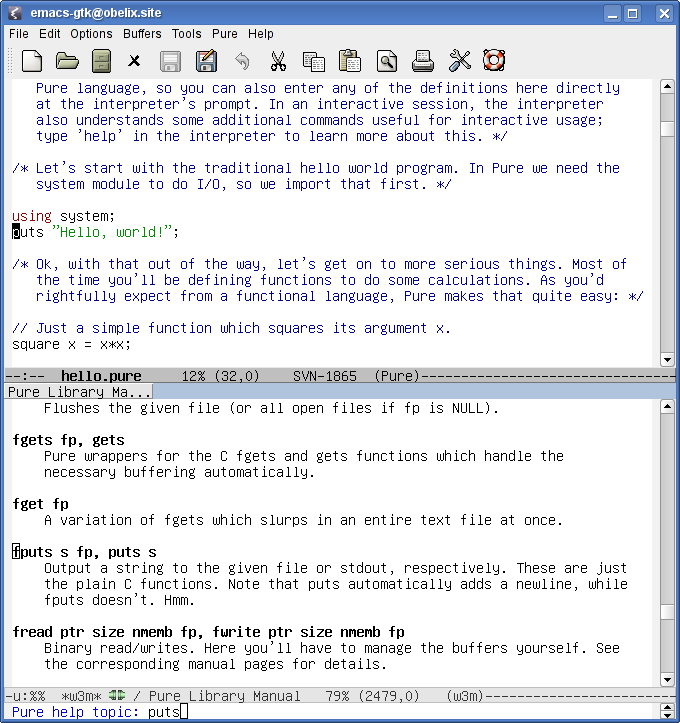 Emacs Pure mode offers many other useful features which turn it into a useful IDE for Pure programming. Try Ctrl-H M in a Pure buffer to read the online documentation of the mode for more details. 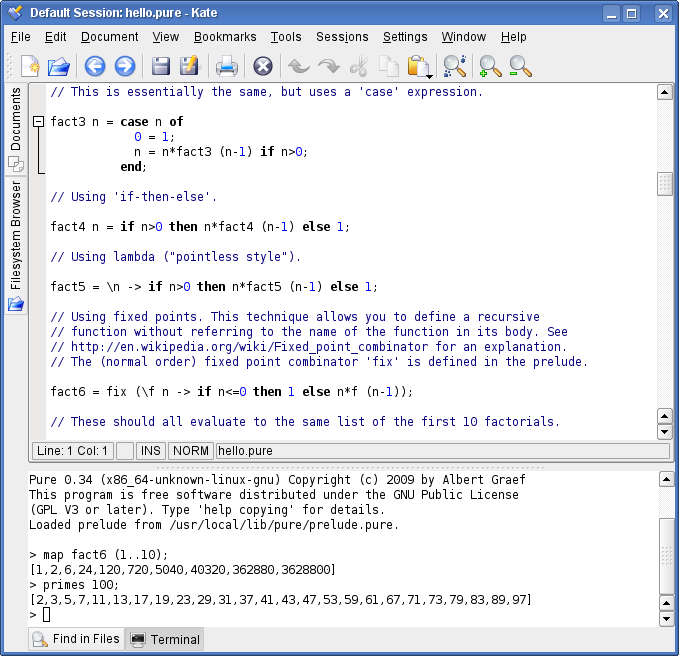 As of Pure 0.56, it's also possible to run Pure as a plugin in GNU TeXmacs, the free scientific editor. 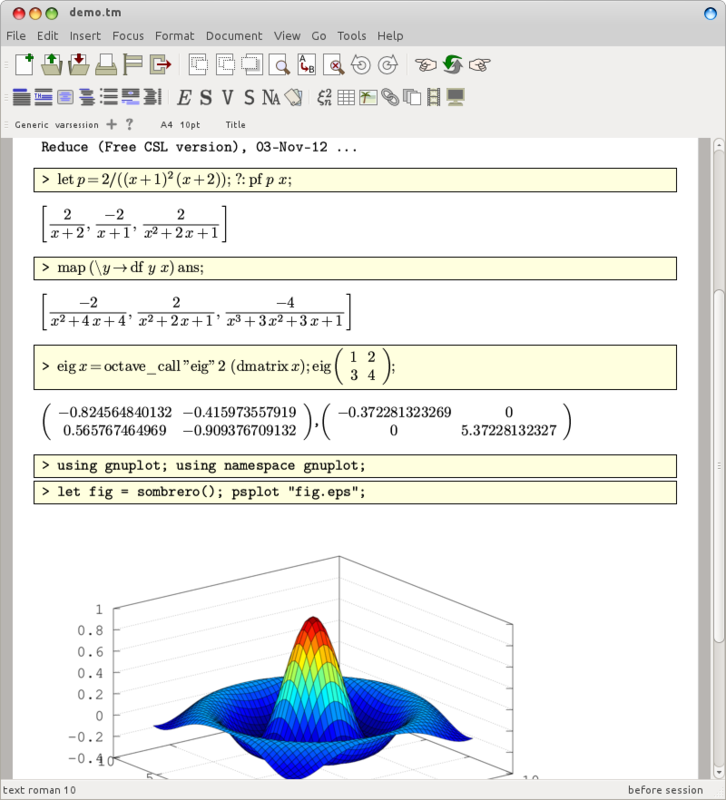 This is especially useful if you also have the Pure Octave and Reduce modules installed, which equip Pure with numeric and symbolic computing capabilities as well as plotting and mathematical typesetting functionality. Math input and output are both supported, so that you can make your Pure scripts and the printed results look like real mathematical formulas. Please check the TeXmacs wiki page for more details. asitdepends has implemented a Pure mode for jEdit, which provides syntax highlighting and completion for keywords. Adam Sanderson has created a TextMate bundle for Pure, which provides syntax highlighting, some useful completions, and documentation look up in MacroMates' TextMate editor for OSX. Other supported OSX editors are BBEdit and TextWrangler; a corresponding syntax highlighting file by Hoigaard/autotelicum is available in the main Pure package. Adam's TextMate bundle has also been ported over to Sublime Text which has gained much popularity recently and is available for all major platforms (Linux, Mac OSX and Windows). This port is named Sublime Pure and is available in its own repository on Bitbucket. It doesn't offer some of the more advanced features of the TextMate bundle yet, but adds support for the Sublime Text build system and snippets, and has been updated to the latest Pure syntax. You can find a Windows MSI package for Pure in the downloads section. This package also includes a little Notepad-like application named PurePad which lets you edit and run Pure scripts on Windows. (Of course it is also possible to run the Pure interpreter directly from the command line or inside a Windows port of Emacs as described above.) PurePad has a simple text editor which does not support syntax highlighting, but it provides the necessary operations to run scripts and locate source lines for error messages. It also offers complete online help.